PRINCESS VROC OF XANDARR, second only to her famous sister, Princess Marilith, is a very well-known daughter of the House of Xandarr. 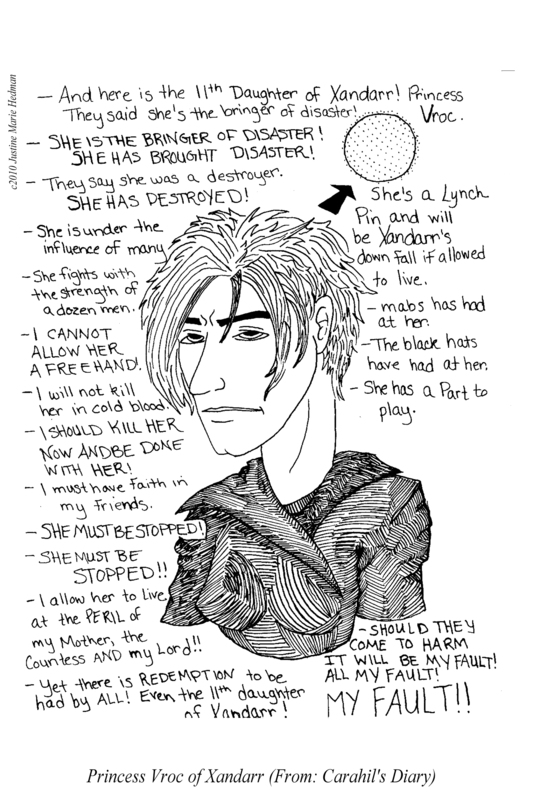 She was born in 003124ax, the eleventh daughter of the House of Xandarr. As per Xandarr tradition, the eleventh daughter is considered very unlucky and she was put out on the terrace to bake in the sun and die. According to legend, an eagle came and suckled her until she was brought back in. Generally shunned and kept in rags, she was sold into prostitution by her father Hezru, King of Xandarr when she was ten. 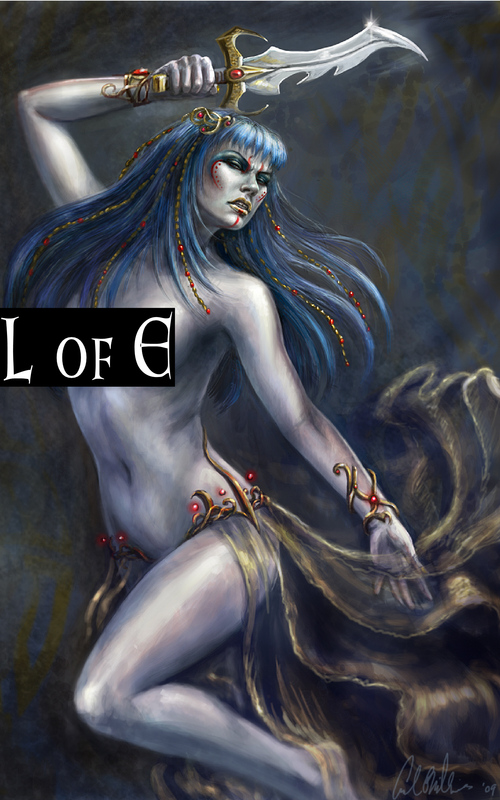 Unlike her sister, Marilith, Vroc was not considered to be overly attractive, and failed as a prostitute. Not knowing what else to do with her, the king sold her to a meat market in Burgon to be consumed. The House of Xandarr was never known much for its morals or couth. What happened after that is largely unknown. It is said Vroc was purchased and taken into the Black Hats. The Black Hats had a powerful hatred of the House of Xandarr after the horrific “Triumph Affair” where many of their order were killed by the Sisterhood of Light, and they craved revenge. They set to Princess Vroc, augmenting her with tinctures and other such dark magic. In any event, when she emerged some years later, was much more than what she was and hopelessly insane. Her tortured mind had snapped in the darkness with the Black Hats. In the dark of night, she returned to Xandarr Keep and killed her family, strangling every last one who was there. She then arranged their dead bodies at the grand feasting table–a place she had never been allowed to sit. She often sat there with them, taking bread and chatting and eating rotten food as if they were still alive. She carried on that way for years, while the Black Hats secretly prepared Xandarr for their revenge–they planned to kill every last being on Xandarr with an ocean of Shadow tech. Occasionally, the Black Hats made use of Princess Vroc, using her to abduct victims and to lure in their enemy, Captain Davage. After the Black Hats were defeated, Princess Vroc escaped. Believing Captain Davage to be her “father” and Sygillis to be a “harlot”, she attempted to blow Castle Blanchefort up, but was thwarted and brought to the brink of death. Having mercy on her, Captain Davage returned her to her lone surviving brother, Balor–who hadn’t been home the night Vroc killed the rest of his family. He took her back to Xandarr and, under his care, she regained the spark of her sanity. Princess Vroc was small and rather skinny, unlike most of her family who tended to be full and rather tall. She had bright blue hair, a usual Xandarr trademark. Either through natural talent or Black Hat augmentation, Vroc was extremely strong–much stronger than a girl of her small size should be. She was also a swordsman and pugilist of incredible skill, being very nearly the match of Captain Davage whose skill as a swordsman was well-known. She was a master of the BEREN, the LosCapricos weapon of House Xandarr. In the aftermath of the Black Hat attack on Xandarr with the planet in ruins, King Balor began offering lessons in swordsmanship and many wealthy League lords came for tutoring with Princess Vroc. The income derived from these lessons helped rebuild Xandarr and return it to prominence. 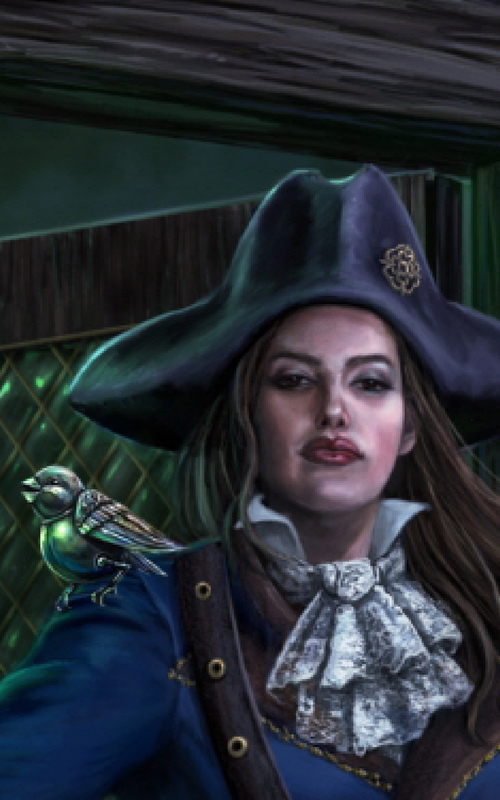 In her days under the spell of the Black Hats, Vroc wore men’s clothing and wore her blue hair cropped in an unflattering fashion, causing many who saw her to consider her quite ugly. Countess Sygillis of Blanchefort said she was “hideous”. After she was returned to Xandarr with her brother, she began dressing in the light, revealing clothing typical there and grew her hair out. Ringed and painted, Vroc did not appear ugly at all, in fact Lord Kabyl of Blanchefort was quite taken with her. 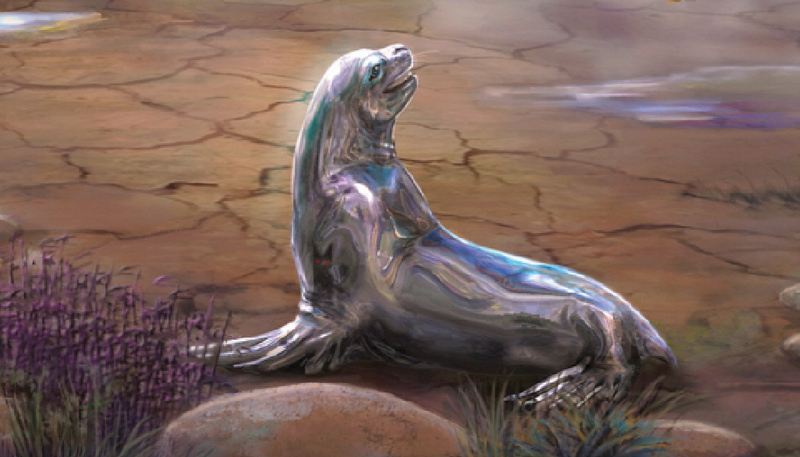 TWEETER is a Silver tech familiar created by Lady Poe of Blanchefort. Although Lady Poe has created countless Tweeter familiars over the years, the one created for Lt. Kilos is the most well-known. Tweeter was one of the first of a long line of familiars perfected by Lady Poe, whose skill with Silver tech was quite remarkable. Lady Poe had a notoriously bad sense of direction. As she was beginning to see much more of Kana with various lords and gentleman hoping to court her, she found she needed something to assist her in getting around and not become lost. 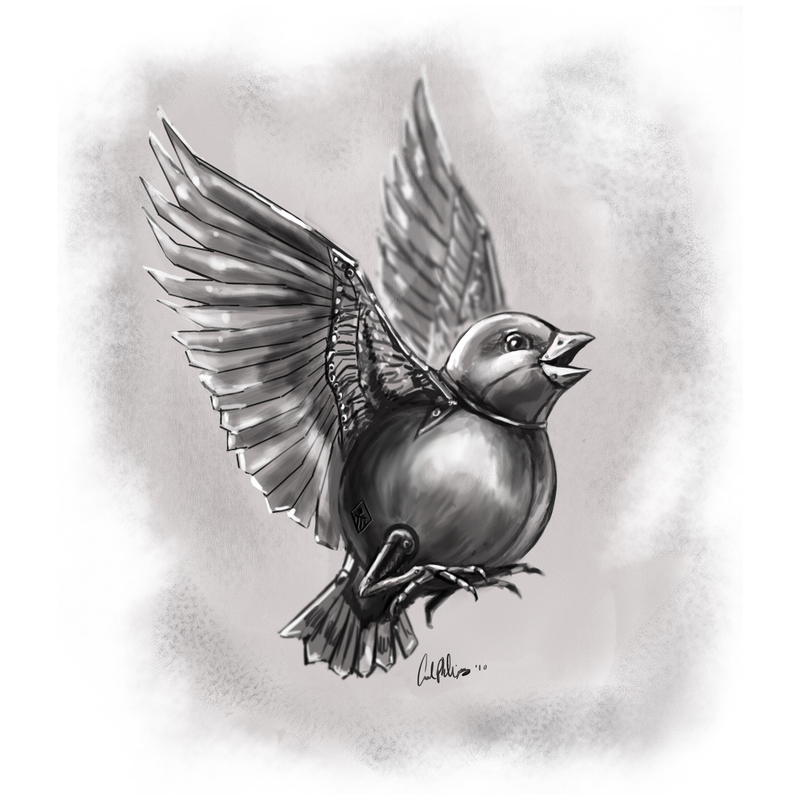 She found hand-held ranging devices to cumbersome and difficult to use, so, Lady Poe created Tweeter, a silver tech familiar in the form of a canary that she could give simple commands to and help her in getting around. The original Tweeter took Lady Poe five months to create and had a series of teething problems that took her a long time to overcome. Eventually she become skilled enough to create him in just a few minutes. He was also originally in the form of an anatomically correct canary, however, Lady Poe began to favor a more fanciful golfball-shaped form that would become his trademark. She incorporated her Blanchefort coat of arms under his right wing, an assurance that he would work as planned flawlessly. She also added a further touch that would become a usual feature with all her familiars–she gave him a perpetual smile. Tweeter could be given simple commands which he would carry out. He could locate specific locations and places without error. With a Tweeter at your side, you could never be lost. There was a bell tower in Castle Blanchefort near Josephina Tower (often times known as Tweeter’s Tower) where she kept a stockpile of Tweeters. Any in the castle may go to the tower and use one whenever needed. A Tweeter lasts of five days by design, but within the bell tower, they are given longer life by the presence of an Auto-Pile–a Silver tech power source created by Lady Poe. Lady Poe created a Tweeter for Lt. Kilos after she quit the Stellar Marines. Her sense of direction was almost as bad as Lady Poe’s and often got lost while staying in Castle Blanchefort and she made frequent use of him. When Carahil talked her into following him into the dreaded Hazards of the Old Ones, it was Tweeter who led her back out thus saving her life and she became very attached to him. When Tweeter came close to the end of his time, Lt. Kilos begged Lady Poe to extend his life and refused to accept another one in his place. Lady Poe connected Tweeter to Ki’s life force, so as long as she lives, he’ll live. He has been at her side for over twenty years. Lt. Kilos’ Tweeter has a number of qualities not found in other Tweeters. Lt. Kilos is convinced Carahil breathed a certain life into him, accounting for his enhanced capabilities. He is able to follow extremely abstract commands (Lt Kilos often says: “find me the best bar in town” and he can do it). He is also able to locate people, animals/monsters and objects. Lt. Kilos often uses him to locate criminals, earning her the nick-name “Manhunter“. He creates music with a collection of bells in Lt. Kilos’ cabin (he pecks the bells) and has developed a recognizable personality over the years–he “hates” other Tweeters, often bullying them around. PRINCESS MARILITH OF XANDARR is a Xaphan hero and figure of lore. She is a popular figure in arcane rites. Many claim to have seen her alive and well in various far-flung reaches of Xaphan space, though the general belief is that she has been dead for over twenty years, killed on far away, rainy Gelt. Princess Marilith was born the third daughter to the House of Xandarr in 002994ax to Hezru, King of Xandarr and his Queen Xanthippe. Being the third daughter relegated her to a rather meaningless place in the Household, however her ambition and ruthlessness did not allow her to remain there for long. Her older sister and brother turned up dead, possibly murdered by Marilith herself. As the eldest daughter of a powerful Xaphan Household, Marilith was selected to marry into a notable League House in the hopes of ending the long-standing League/Xaphan conflict. Marilith and her entourage toured the League as she searched for a suitable pairing and became verify popular in League Society. She eventually selected Lord Davage of Blanchefort, and, unexpectedly, Marilith and Davage fell in love. Their wedding was the event of the millennia, however, it never came to pas, as Lord Blanchefort’s sister, Lady Pardock of Blanchefort, believing Marlith to be an unprincipled heretic and monster, threw down the ceremonial wedding baton, thus separating Davage and Marilith forever. Marilith returned to Xaphan space. spiteful and bitter. Instead of fading back into court life on Xandarr, she embarked on a long crusade against the League, mostly to get as near to Davage as she could. Mounting an assortment of vessels always known as “Bloodsimple” she took on Davage and the Fleet in a protracted 70 year campaign. She proved herself to be a capable ship’s captain and, though she lost most of her battles in space with the Fleet, she always managed to elude capture and escape to the shadows to try again. Her pure persistence and tenacity made her a Xaphan hero. 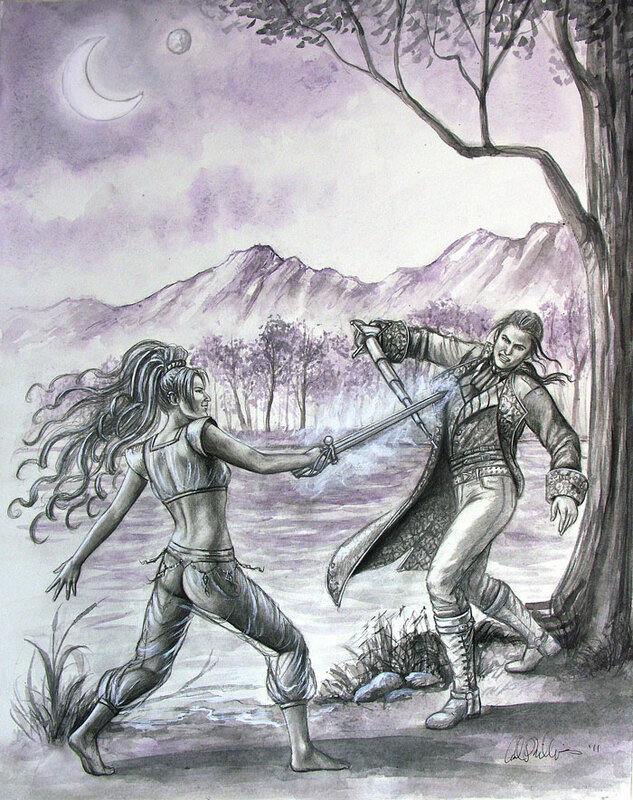 Eventually Marilith came to grips with Sygillis of Metatron, an ex-Black Hat who had captured Captain Davage’s heart. There in a terrible battle on the distant world of Gelt, Sygillis killed Marilith and impaled her, along with all her henchmen, on a Silver tech stake. Princess Marilith was tall and statuesque. Being of the House of Xandarr, she had bright blue hair in their tradition. She generally wore the light, revealing clothing indicative of that worn on Xandarr that often failed to account for the demands of modesty. She carried a mystical dagger of silver and gold given to her as a wedding present from her father known as Moonglow. Her stated goal was to plunge Moonglow into Captain Davage’s chest. Her usual practice was to scratch the name “Bloodsimple” into the bridge bulkhead with her dagger. It was said, doing so imparted an odd sort of unlife into the vessel. Marilith was known for coming at the League in a variety of warships. Her favorite was the large, basttleship-like Ghome 52. Her vessels usually lasted one or two engagements before they were shot out from under her. copyright 2011, Ren Garcia and Carol Phillips. A key component in World Building, in my opinion, is creating the mundane things–the small stuff that makes people who they are. In creating a sci-fi fantasy world, where everything is made-up, possibly new and rather alien, adding in the mundane is key to drawing your readers in and making them feel at home in your unreal world. You want your readers to be comfortable. You want them to stay awhile. Traditions and customs play heavily into that notion. A regions’ customs and various traditions set it apart from others, make it unique, make it real. On the planet Xandarr, for example, I created the tradition of children writing letters to Carahil. Carahil is Xandarr’s patron god, and he saved the planet from destruction when the Black Hats wanted to wipe it out. They honor him with numerous statues carved all over the planet, particularly in a lush park by the River Torr called 1000 Carahil Park–aptly named as there’s 1000 large and small statues of him rolling around. In the time since Carahil saved Xandarr, a tradition sprang up where children from all over the planet write Carahil little notes, sort like letters to Santa, asking him for this and that. Some ask him for material things that they’d like to have, others beg for help of some sort, and others just need a friendly shoulder to cry on. They then leave the notes they’ve made at the base of one of his statues tucked in the flippers and hope he hears them. Many times, he does. Carahil is an interactive, approachable little god. It’s a cute tradition, just a splash of color on the page and only takes a few words to lay out, but it helps immeasurably in making the people of Xandarr, who are just figments of my imagination, seem real. A tradition of leaving notes by a god’s statue helps define who these people are, what they want, and what they hope for out of life. For Book IV, The Machine, I wanted an example of a Letter to Carahil to place into the interior of the book, and I wanted a real “kid” to draw it to make it authentic. 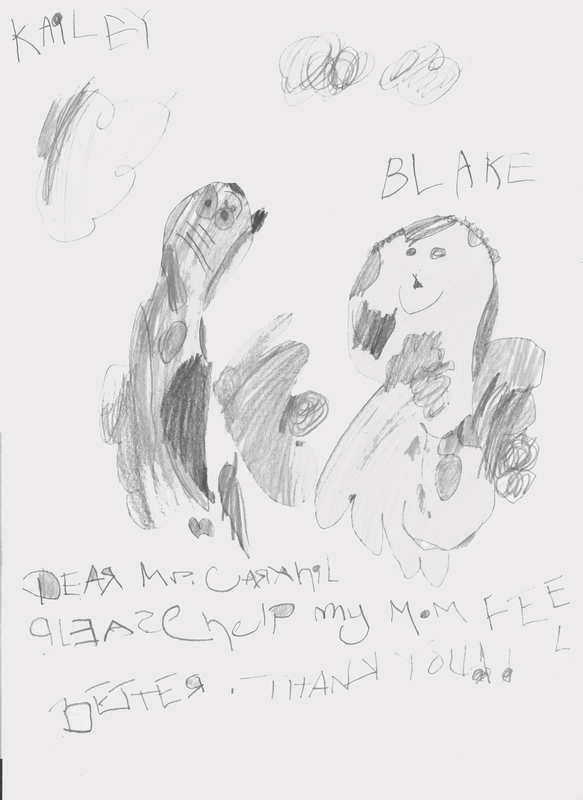 So I commissioned four-year old Kailey Hedman, daughter of one my regular artists, Justine Marie Hedman to do the job, and here’s the result–a real live letter to Carahil from a real, live kid. I wonder if he’s heard it. In attempting to grow my readership, I take the Carnie approach–I hit the road and mingle with the people. It’s exhausting, sometimes it’s dirty and unpleasant, but it’s also effective and, when successful, is quite fun. I’ve learned a lot in the past year or so and have refined both my setup and my personal technique, and I thought I’d share some of those revelations. Most of this is probably Basic Marketing 8:00am Day 1, but hey, each nugget of information presented here is hard won and battle-tested, and is therefore gold. YOUR BASIC LAYOUT First thing. You need to present the idea to a customer that you’ve got something to sell–Seems simple, right, but for a beginning author with usually one solitary thing to offer, creating the impression to the buyer that you’ve got something they might want to buy can be difficult. An unknown authors sitting behind a drab table with naught but one thing to offer is, nine times of out ten, going to get passed by. You can attempt to cloud the issue with lots of marketing–you know, standups, banners, balloons–anything colorful and eye-catching that fills up the empty space around your table, but, when you get right down to it–people like seeing a lot of stuff in front of them. Seeing a lack of product is depressing. In my case, I’ve got a six foot table, so I try to fill up that space as best I can. I push everything out front, creating the illusion that the table is bursting with product. 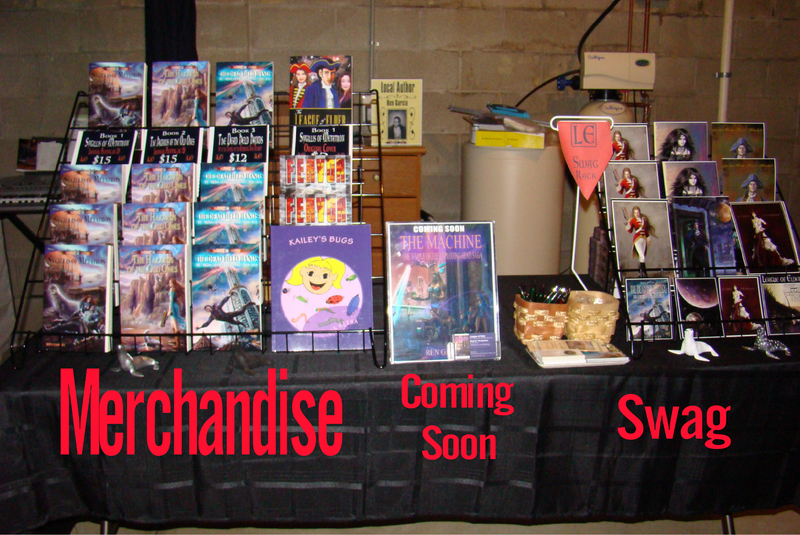 I then organize the table with sellable items on my right and Swag, or free stuff on my left with advertisements (specials, combos, Coming Soons, etc) in the middle. 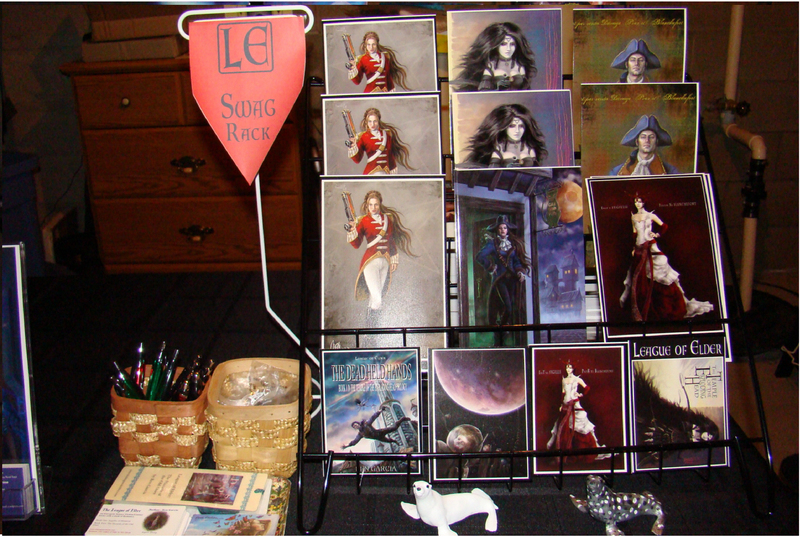 THE SELLABLES: Here’s my sellable marketing rack. First of all, notice how full it looks. I only have three titles to sell (Books I, II and III), however I create the convincing illusion that I have many many more titles to choose from. I accomplish this with (A) vertical striping that pulls the eye from top to bottom, and (C) I space the books out so that they fully encompass the entire rack–having empty spots is a downer. 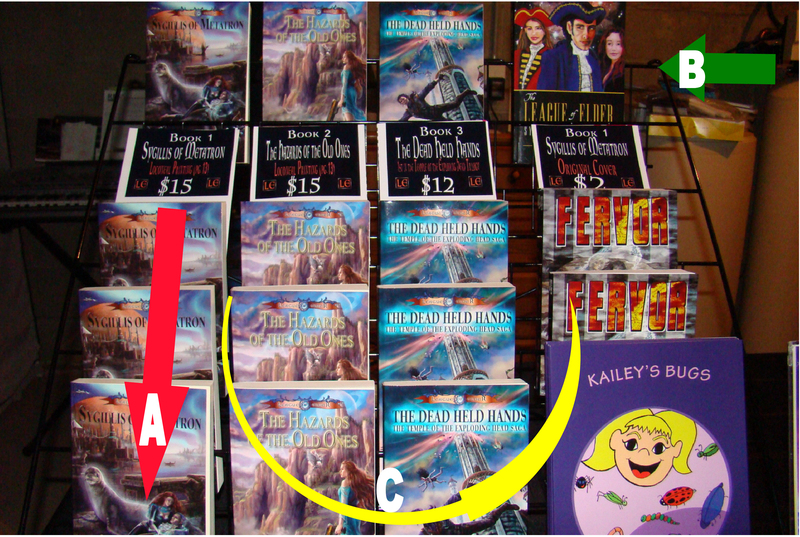 I also further enhance the illusion by having the same titles only in different covers (Notice B–Book One. Same book, just different look). I also fill out the rack by offering titles from other authors–in this case from my friends Chantal Boudreau’s Fervor and Justine Marie Hedman’s Kailey’s Bugs. It’s a symbiotic relationship. Also, notice (B)–All of the titles are at eye-level. That’s the main thing. The customer doesn’t have to do much work to locate the product for sale, such as look down to the table-top–it’s all right there in front of them. For an unknown author expecting a passerby to look around for your stuff is an investment in time and effort many folks are not willing to make, it’s an unfortunate truth. Make it easy for them by getting everything up and off the table. SWAG: People just love free stuff and having lots of swag around is always a must. I’ve got a smaller rack just for oversized cards with art, I’ve also got pens, pins, posters, shirts, bookmarks and magnets. For cards, I’ve found people really like the oversized cards, which was a surprise to me. I usually charge one or two bucks per piece of swag, but, if someone buys a book, they can have all the swag they want for free and that sometimes makes a deal. So that’s my deal on book marketing. Of course no amount of marketing or swag will help without your critical input. You’ve got to stand up, be vocal, look people in the eye and be prepared to have to work hard for every single sale. Do that, and you can’t lose. THE TEMPLE OF THE EXPLODING HEAD is a place of mystery and lore on Kana. It is virtually unknown in League learned circles and is wholly disregarded by the Sisterhood of Light, who believe it to be nothing more than pagan nonsense. The Monama peoples of the south of Kana know of the temple, have hinted at in their ancient writings and whispered of it in their most private moments. They claim it is a place of bluestone deep in the ground where the Horned God lives. They say all of the demons and haunt their nightmares come from the temple. They say it is a nexus of many places given life by the Horned God who is repaid with fire and blood. The Monamas claim his angels have been engaged in bloody worship and sacrifice in the cavernous belly of the temple continuously, without pause or breath, for thousands of years. The Temple is a deadly place for both the victims dragged there in chains to be sacrificed, and for the worshippers as well, for death can strike anyone at any given moment. The great professor from the Calvert University of Dee, Grand Dame Hannah-Ben Shurlamp, EvoR, conducted a seminar on the Temple of the Exploding Head before a gathering of her peers in St. Edmonds, however, she treated the temple as a purely allegorical reference using it to highlight the evils and dangers of sin and unbridled lust. At no time, did the EvoR proclaim the temple as an actual place. The great Remnath hero, Atrajak of Want, sought out the temple at the behest of his dying wife, Tiverlan of Nebulon, who was a Monama princess. She said all the woe Kana had ever known came from the bloody environs of the temple and she begged him to locate and destroy it. Atrajak searched the whole of Remnath, finding nothing but ghosts and rumors. Eventually, Atrajak came to grips with the Sisterhood of Light at their stronghold of Twilight 4, where he was killed in a terrible battle. His search was the last real effort to locate the temple and discover what is done there. 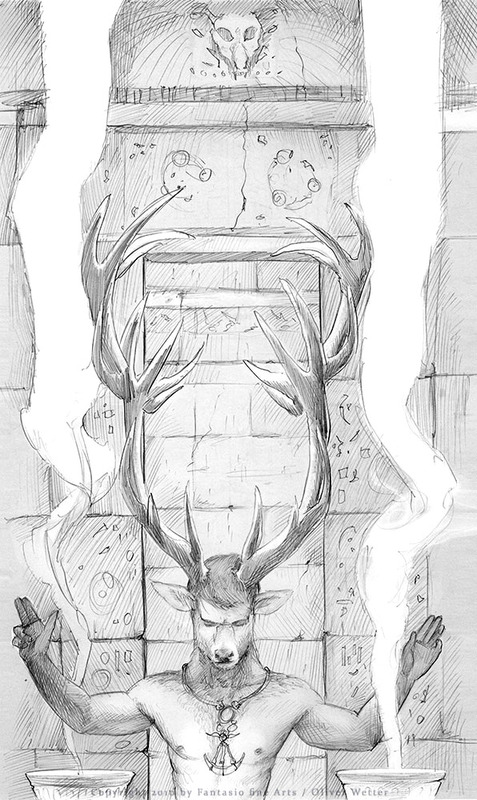 The Temple of the Exploding Head and the Horned God remain objects of whisper and speculation.